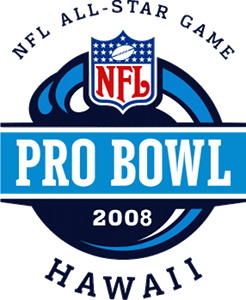 The 2008 Pro Bowl was the National Football League's all-star game for the 2007 season. It was played at Aloha Stadium in Honolulu, Hawaii on February 10, 2008. The game was televised in the United States by Fox and began shortly after 11:40am local time following Pole Qualyfiling for 2008 Daytona 500. The NFC won, 42–30, despite a 17-point first half AFC lead. NFC running back Adrian Peterson rushed 16 times for 129 yards and was named the game's MVP, winning a Cadillac CTS in recognition of his efforts. The starting rosters for the game were released on December 18, 2007, with New England Patriots quarterback Tom Brady starting for the AFC and the Green Bay Packers' Brett Favre for the NFC. However, Brett Favre withdrew due to an ankle injury. Notable Pro Bowl selections included the late Sean Taylor. The Dallas Cowboys had a record thirteen players named to the Pro Bowl roster, while five teams, including all four members of the NFC South, had no players initially named (Jeff Garcia of the Tampa Bay Buccaneers was later chosen as a replacement quarterback for Brett Favre.) On February 4, 2008, Brady, Patriots receiver Randy Moss, Chargers tight end Antonio Gates, and Chargers defensive lineman Jamal Williams decided to pull out of the 2008 Pro Bowl. Brady was replaced by Cleveland Browns quarterback Derek Anderson, Moss was replaced by Cincinnati Bengals receiver Chad Johnson, Gates was replaced by Browns tight end Kellen Winslow, and Williams was replaced by Pittsburgh Steelers defensive lineman Casey Hampton. The AFC was coached by Norv Turner of the San Diego Chargers staff, while Mike McCarthy and the staff of the Green Bay Packers coached the NFC. Three Washington Redskins players (Chris Cooley, Chris Samuels and Ethan Albright) wore #21 in memory of Taylor, their deceased teammate. The game featured 41 players appearing in their first Pro Bowl (out of 86 total players), the most in eight years. In addition, the NFC played their first defensive play with only ten players on the field, lacking a free safety, in Taylor's honor.